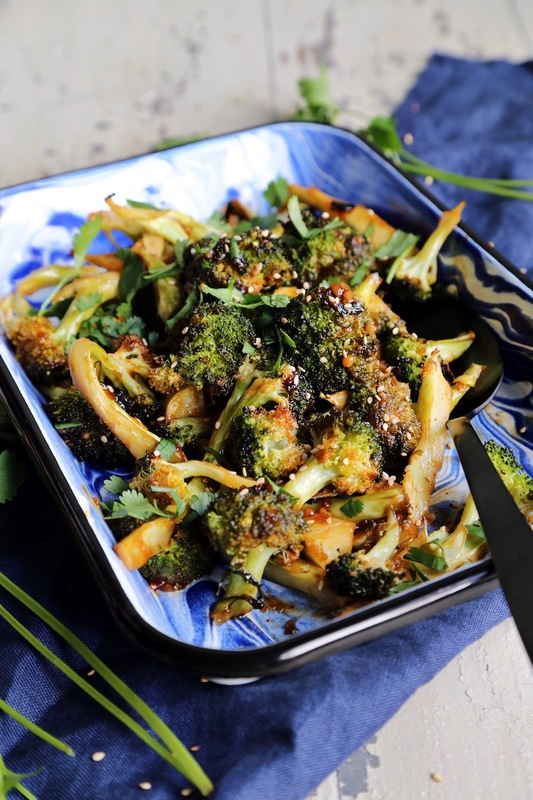 Bring a little lightness to the new year with a new, easy recipe for roasted broccoli with a Asian twist! 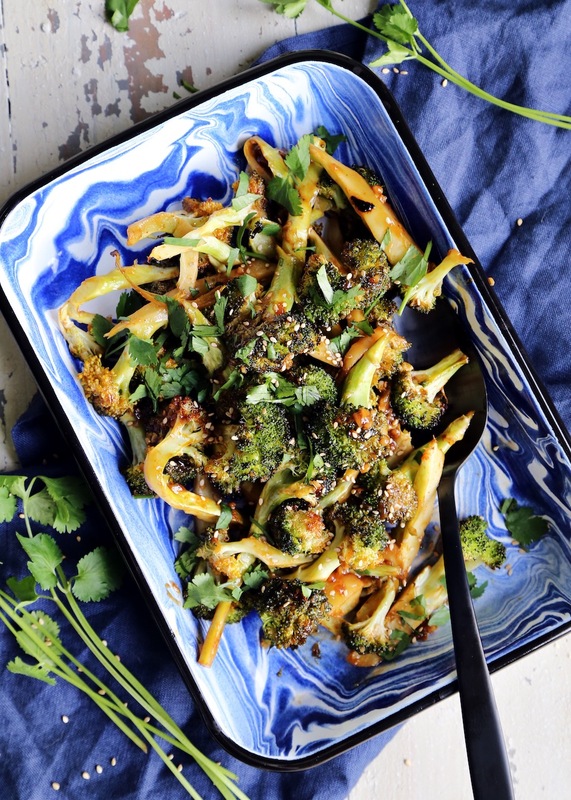 This Szechuan roasted broccoli is sweet and tangy, and ready in a flash! It’s a new year and I am fired up and ready. Emphasis on the fired up, because last week something really got me heated. I made it a point to never read the comments on articles, particularly on Facebook, but one in particular that was written with the sole purpose of telling food bloggers to leave out the personal stories, diatribes and narrations, and just “get to the recipe!”. And it struck a chord with me for several reasons. The backstory to all of this is that for many, including myself when I first started eight and a half years ago, started their blogs because it was a hobby. It evolved, and for some food bloggers, this is their sole income. For me, I have a full time job, and while this is something I do when I am not at work, it is still a job that earns me money and affords me opportunities I wouldn’t normally have. For that, I am eternally thankful. I am also grateful and fulfilled by the kind comments I get from people who want the recipes I provide, that I have worked on, and made with a great deal of love to bring people together. Food and time spent being of service to others is my love language and when it connects with others, it makes me blissfully happy. And hearing that from people is among the greatest compliments we food bloggers could receive. But there is another side. And it is not always sunny. There are those readers who just want to click, and get the recipe, and are annoyed by the fact that we include words, personal stories, and lots of photos that we have taken of one dish to create an experience for people. And the kicker is, we have done this to provide people with a recipe, for free. But, it is not free for us who have created it. I got everything from “see, we’re readers, do what we want!”, “you don’t have to write a blog you know…”, “this blogger is unhinged!”, to calling me a “C*nt”. Not. even. joking. This is where I realized that because I write a “blog” it is automatically deemed less relevant, less meaningful, and less professional than the larger food sites that also provide free content to readers. But this is my business and we do everything the same as the larger sites do, but with one person, not teams. Not only do I sync my personal finances into this hobby-turned-business, but it requires far more than just typing words and hitting a button to publish a recipe. Behind the scenes there is a web designer whom I hired, a host that I pay monthly, a manager for my social media, a subscription service so I can provide emails to readers, purchasing of cameras, props (so many props), photo editing tools that I have to pay for so people can click a link and be transported to recipes, photos and more. There is the six hours that it can take to get one simple recipe from me to you, from store shopping, cooking, testing, photographing, editing, writing, publishing, and then promoting on social media so that one of my “free” recipes can be seen by my readers, and hopefully a few more. So while our content is “free”, it is not free to create. How do we manage to create all this free content and make money? Yes, we do host ads. Yes, we do sponsored work in hopes that we can cover our costs to do what we do, and hopefully, make a few extra dollars along the way. It took me four years of constant work, time, lots of tears, doubt and willpower to turn a profit on this hobby-turned-business. It has afforded me opportunities to travel, meet some of my dearest lifelong friends, grow in my love of food and photography, and it has led me down the path to publishing my first cookbook, and helped me and my family travel, and buy a house. I am one of the lucky ones, and that is not lost on me at all. But I implore those who see what we do as less significant to please think for a moment of what goes on behind this hobby of ours to provide our readers with something we hope will make a lasting impact on them and their families. These blogs chronicle our lives, adventures, hardships, joys, and more. We talk about food because it brings us together, it is a commonality we all share. We post multiple photos because we love them, we write paragraphs because we need to tell a story. Do we think about how many paragraphs in a post maximize our ad space, or how many times we need to write the title of the recipe in our post to get the best bang for our SEO buck? Sometimes we do, sometimes we don’t. At the end of the day, is it just “a blog”? Yes. We know we aren’t Mother Teresa, as I was called, and we aren’t saving the world. We want to create experiences for others, share good food, and find a common denominator in our lives, hopefully being inspiring, uplifting, and letting us know that in this big great universe, we have someone else doing the same thing, and finding one another in the ethos. And if carbs, and chocolate bring us together, than hell yes, let’s celebrate it, not denigrate it. In a world where we have come to demand things instantaneously, perhaps it’s time to re-engage ourselves in the lives of others, taking a few moments to realize how interconnected we all are, in life, our experiences, and our own personal growth. Social apps, media, and Facebook give us the ability to scroll to the things we want to see, and scroll right past the things we don’t, in an instant. And perhaps that has made us more impatient, and willing to gloss over the experiences others want to convey, in our thousand word stories that were bashed in the article, all for something to serve us instantly, like a free recipe, instead of investing a few extra seconds on someone else, whose craft has provided that very same recipe. While I’m not a chef, I haven’t worked a line, and I don’t claim to be, we can look at what others have done and be thankful to heard their experience and value it. No one person’s experiences, work or craft is less worthy than someone else’s and for just a minute, we can do away with the false equivalencies and appreciate the work and time of others. Don’t be the person who sees a fine piece of artwork and offers to pay $35 for a painting, when the artist is asking for $500 and say “it’s just paint on a canvas, why would I pay $500 for that?!”. They are providing their time, mind, craft, and heart to something in hopes it connects them with someone who sees it for the value it is. If it’s not to your taste, that’s fine, move on. But do so without bashing, sniping, and being most of all, unappreciative. We all have something of value to offer. If you made it 1,500 words into this post, and didn’t want to just get to the recipe, thank you. Thank you for your time, patience, listening, and hearing me. It wasn’t done to take up space, make more money (because I’m sure this won’t), but to help people realize that we do this because we love it, so please, allow me to take 5 seconds of your time, and if you only have time to scroll for the recipe, so be it. Hopefully one day you will have the time and fortitude to read our words and accept them for what they are, a gesture and an opening of our hearts and lives to others. Will I add a “jump to recipe” button some day? Maybe. But in the meantime can we all just be thankful that you stopped by, and that for one second, we were connected. 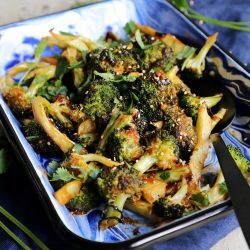 Chop broccoli crowns into large chunks, or strips. Place on a silicone mat lined baking sheet. In a small bowl, whisk together the olive oil, hoisin sauce, sriracha, garlic, ginger, salt and pepper. Pour this over the broccoli, and toss to combine. 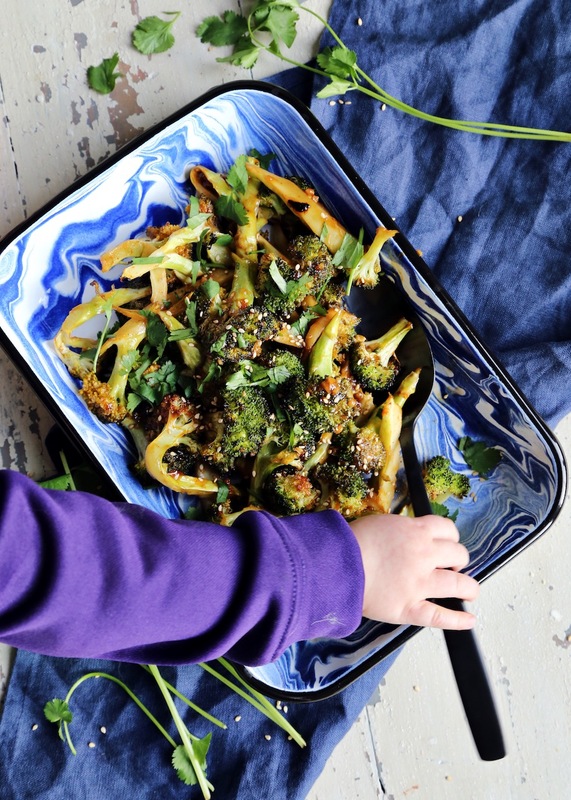 Place the baking sheet in the oven and roast the broccoli for 17-20 minutes, or until it is fork tender. Remove from the oven and sprinkle with toasted sesame seeds and cilantro. Serve immediately.